Easy screw on orange coils that hold oranges more securely than simple cups. Copper clips that hold the jelly bowls securely while making it easy to remove to clean or fill. Beautiful rippled orange jelly bowls that add beauty and add more orange to attract more Orioles. Beautiful orange beads that also add beauty and Oriole attraction. 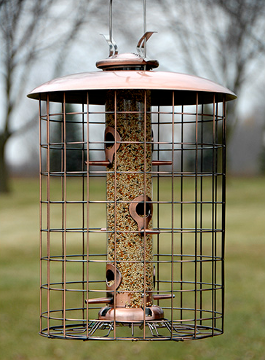 Solid copper construction that lasts a lifetime and ages into a beautiful patina color.